Join the City of Vancouver at an open house to continue the conversation on how to improve the City’s land use policy and regulations. Learn about what the City has heard so far and some proposed ideas for change. You don’t need to have technical expertise to participate – just an interest in improving the City’s land use regulations, policies and guidelines! 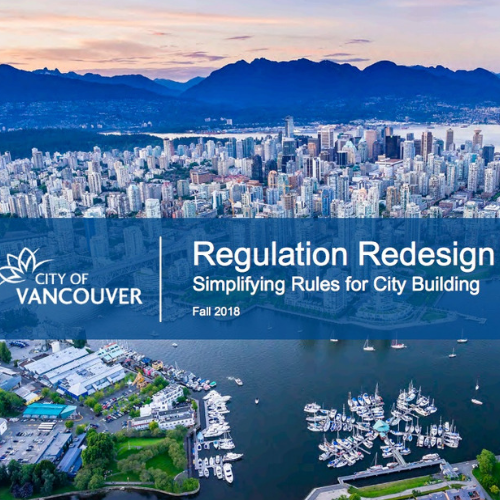 In fall 2018, the City of Vancouver started a comprehensive review of its regulations, policies, and processes for planning, development and building. Watch the City of Vancouver Regulation Redesign Video and learn more about the project timeline and anticipated milestones. Read the Regulation Redesign presentation for the project’s key objectives and background information.